The Wolf Ridge 9 sports at its core a full carbon fiber unidirectional frame that features the revolutionary 160mm travel Naild R3ACT-2 Play suspension system which means it has the widest range of climbing to descending capacity on the market. No longer do you have to compromise on suspension travel while in search of pedaling efficiency. Up front is the superb RockShox Lyrik RCT3 suspension fork with 160mm of travel as well as the Boost spacing (110x15mm) thru-axle for optimal ride quality. The Wolf Ridge 9's drivetrain features SRAM X01 Eagle 1x12-speed components that take everything you love about SRAM's pioneering 1x drivetrains and increases its wear life, toughness, precision, and smooth, silent operation. The 12-speed cassette utilizes a 50T large cog that increases the range of gears so you can tackle anything and everything in your path. SRAM components are also utilized for brakes with their Guide RS hydraulic disc brakes ensuring exceptional stopping power in all weather/trail conditions. 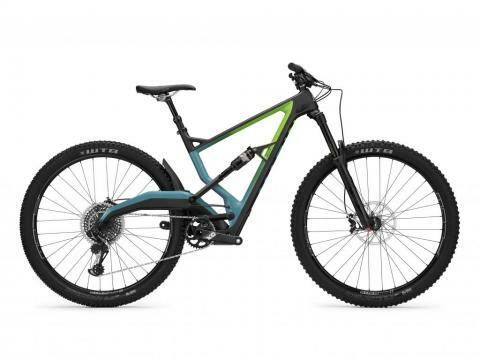 This 29er's wheels feature Stan's NoTubes Flow MK3 rims and Stan's NoTubes Neo hubs with Boost spacing (110x15mm thru-axle front/148x12mm thru-axle rear) for superb performance and reliability. Topping the wheels are a set of WTB tires - the Vigilante 29x2.3" up front and the Breakout 29x2.3" in the back.